The standard 2017 UEFL draft is now complete and the results are as follows. Membership/roster information may be viewed via the 2017 standings page on the UEFL Portal. 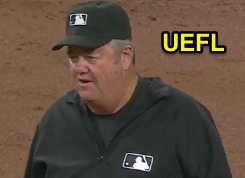 Joe West, once again, was the most selected. Crew Chief Draft: 17 of the 19 available crew chiefs (89%) were drafted: As in 2016, the most common selection was Joe West (25 times), followed by Jeff Kellogg and Ted Barrett, who each were chosen 11 times. Larry Vanover and Jerry Layne were the only two crew chiefs not drafted. The least commonly drafted crew chiefs, of those selected, were Fieldin Culbreth, Bill Miller, Mike Winters, and Paul Emmel, who each were drafted just once. Gary Cederstrom, Jerry Meals, and Mike Everitt were chosen twice each. Primary Umpire Draft: 44 different umpires were drafted in the Primary, or exactly 50% of the total field, which included minor league call-ups. Joe West was the most selected Primary umpire (14 times), followed by Vic Carapazza (11 times), Will Little (nine times), Hunter Wendelstedt and Chris Guccione (eight selections each). The most frequently selected Triple-A/MiLB call-up umpire was Toby Basner (twice). > Primary Pairings: No two Primary umpires were paired together on more than three ballots. Vic Carapazza and Joe West were drafted together three times, as were Hunter Wendelstedt and Joe West. Pairs that appeared twice were: Tripp Gibson and Joe West, Angel Hernandez and Joe West, Brian Knight and Chris Guccione, and Hunter Wendelstedt and Will Little. Secondary Umpire Draft: 65 different umpires were drafted in the Secondary category, representing 86% of the available 76 umpires. The most frequently selected Secondary umpires were Joe West, Greg Gibson, and Dan Iassogna (tied for nine selections each); Dan Bellino, Vic Carapazza, and Angel Hernandez (eight each); and Chris Guccione (seven times). > Secondary Pairings: No two Secondary umpires were paired together on more than two ballots. Secondary umpire pairings that appeared two times were: Dan Bellino and Vic Carapazza, Bill Miller and Joe West, Greg Gibson and Angel Hernandez, and Marty Foster and Jerry Layne. > Crew + Primary: Only one configuration of Crew Chief + 2 Primary Umpires appeared twice amongst draft ballots: That of Ted Barrett (crew chief) and Brian Knight/Chris Guccione (Primaries). No such repetition existed amongst Crew + Secondary, and, thus, no two crews were identical. Undrafted Free Agents: Umpires not selected in any of the above drafts include Mark Carlson, Chris Conroy, and David Rackley. MiLB Undrafted Free Agents: Minor League call-ups not selected during the Primary phase include Sean Barber, Ramon De Jesus, Ben May, Roberto Ortiz, Stu Scheurwater, Chris Segal, Chad Whitson, and Tom Woodring.